Hindsight is always 20/20. An irony that isn't lost in the pre-WW 2 drama A Happy End, about affluent Jews enduring the first signs of Nazi violence in the early 1930s. The Erdmann family -- the gifted scientist Mark (Curzon Dobell), his elegant wife Leah (Carmit Levité) and talented teenage poet son Hans (Phil Gillen) -- enjoy all the cultural and scientific benefits of Berlin. That is, until 1932-'33, when Hitler's rise in the Reichstag and the outbreak of virulent anti-Semitism quickly establishes Germany as dangerous for Jews. The question is: Will they realize their peril in time? Playwright Iddo Netanyahu posits a family so preoccupied with their own concerns, even the dire warnings from Mark's colleague Dieter (Joel Ripka) fall on deaf ears. Or is denial the human condition? Exit strategies are either the province of the insightful or the dispossessed. The German-born Dieter boasts almost visionary instincts. But it's his status as Leah's lover that proves, in part, their undoing. And that's Netanyahu's point: When does refusal to face reality turn destructive? More specifically, how long can we ignore the warning signs of our own demise? Mark is a scientist of acclaim; he cannot believe that the Germany of art and culture will tolerate Hitler. Leah, a wealthy woman consumed with culture and psychology, is charming, beautiful and bewitches both her husband and lover. A connoisseur of Berlin, she cannot envision herself in another country, devoid of language or connection. Thus, the irony of the title. It echoes, to some degree, the real-life sentiments of German Jews in the 1985 documentary We Were So Beloved. They fled to Washington Heights in Manhattan in the late 1930s to escape the Holocaust, yet many could not believe their beloved country had betrayed them. Neither do the Erdmann's. Led by their mutual obsessions, despite the horrors of the "human sewage" attacking her husband, Happy End is an intriguing and sobering tale. Though given the circumstances -- or is it the audience's knowledge of history -- their blindness, initially understandable, seems almost willful. The emotional hardships aren't ignored, thanks to an excellent team of actors led by the alluring Carmit Levité and directed by Alex Dmitriev. But the insular production would be richer if it mined its characters more deeply. All are aided by Laura Crow's exquisite costumes and Blair Mielnik's smart set design. Black-and-white projections of Germany during the period add a documentary edge to the ensuing tragedy. History is a ripe topic for theater, but it can also be exploited for commercial gain. Which is the case in The Audience, which stars the incomparable Helen Mirren as Queen Elizabeth II. 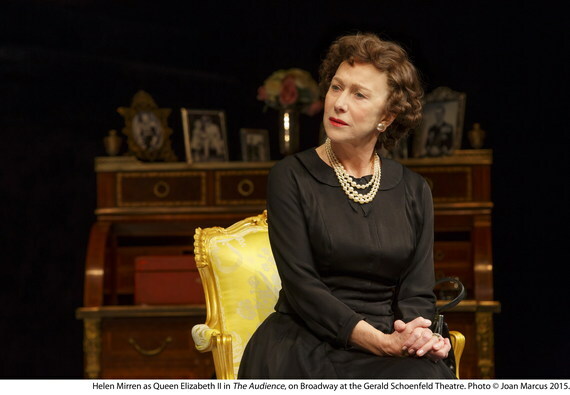 Now on Broadway at the Schoenfeld for a limited run through June 28, Audience refers to the private weekly sessions between the queen and her prime ministers. Since she first ascended the throne, Elizabeth has had 12 prime ministers, beginning with Winston Churchill (Dakin Matthews) in 1952 to Gen Y's David Cameron (Rufus Wright), who endures an elderly sovereign nodding off at his reports. In between, she greets everyone from Gordon Brown (Rod McLachlan) to Margaret Thatcher (Judith Ivey in a staggering over-the-top wig) to a nervous John Majors (Dylan Baker). Mirren's ability to project ER's 62-year reign is remarkable -- she seamlessly appears young in one moment and middle-aged the next. But here's the catch: Everything said in these sessions is secret. Whether the queen gets friendly with Labour leader Harold Wilson (a wonderful Richard McCabe) or sides inexplicably with the Egyptians during the seizure of the Suez Canal, to the consternation of Anthony Eden (Michael Elwyn), who fears Nassar's fascism, is anyone's guess. 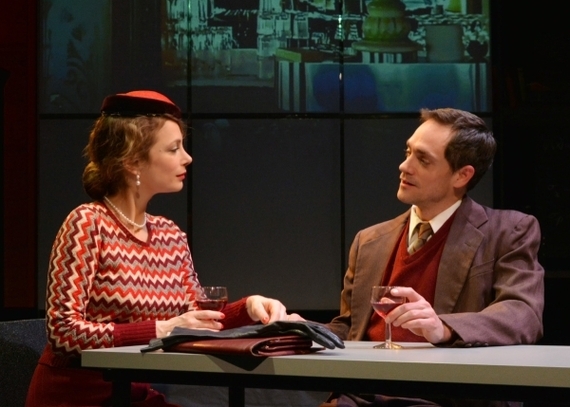 The Audience is more a series of vignettes than a fully realized play. Peter Morgan, who wrote the film The Queen, which earned an Oscar for Mirren, presents a far more informed and sensitive royal than the one who botched family and politics in her cinematic incarnation. Frankly, the queen owes Mirren a debt. She seems to have single-handedly upped her popularity -- despite ER's insistence, among the richest women in the world, that she pays no income tax. The Audience has some interesting moments and a first-rate cast, but it is hard to see its relevance to a U.S. audience. It's doubtful many Americans know Harold Wilson or Anthony Eden, even fewer have kept pace with Britain's post-war history. That doesn't detract from Stephen Daldry's solid direction or Bob Crowley's august set design. But it does underscore the point: The most regal export to our shores is Mirren's thoughtful and charming performance.